For the second layout pack of this week, Kenny and his team have created a lovely Jeweler Layout Pack with 7 mesmerizing layouts that highlight elegance and skill. 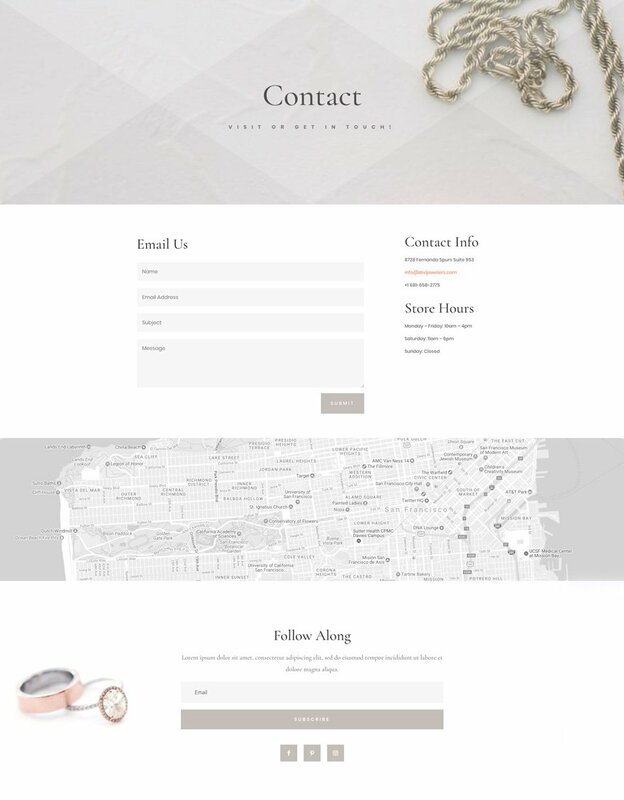 This layout pack perfectly represents the values you’d expect from a jeweler website. The eyecatcher of this layout pack is without a doubt the education page that explains creation process steps in a clear and visually appealing manner. 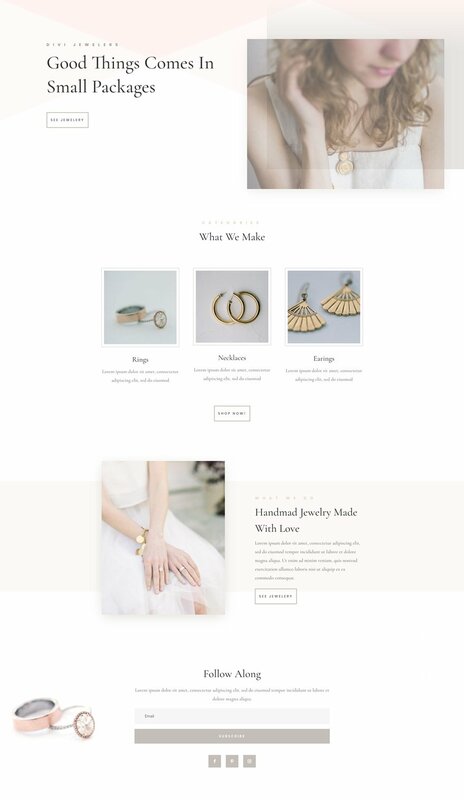 The Jeweler Layout Pack’s 7 elegant layouts, high-quality images and beautiful illustrations make the layout pack an excellent choice to create a jeweler’s website from scratch. The use of soft colors and elegant font families give visitors a luxurious and refined feeling that perfectly represent the quality that’s expected from a skilled and respectable jeweler. To access your new layout, simply activate the Visual Builder when editing a page and look for the “Load From Library” icon in the page settings bar (it looks like a plus symbol). Click this icon to launch the Load From Library popup. Under the Premade Layouts tab, you can easily find the new layout by scrolling through the list of layout packs. Once you find the Jeweler Layout Pack, click on it. You will see all the individual layouts included in the pack. Select the layout you want for to use and then click the “Use This Layout” button. We hope you enjoy this layout pack. And to help ensure that you do, we’ll be doing a live stream on our Facebook page next Tuesday at 3pm EST to walk through how to use empty sections to create a stunning design. Why can’t I just download this layout pack to my hard drive and use it later? I not currently have a site I wish to use it with. I am logged in to my ET account but do not have the ability to download the layout pack. 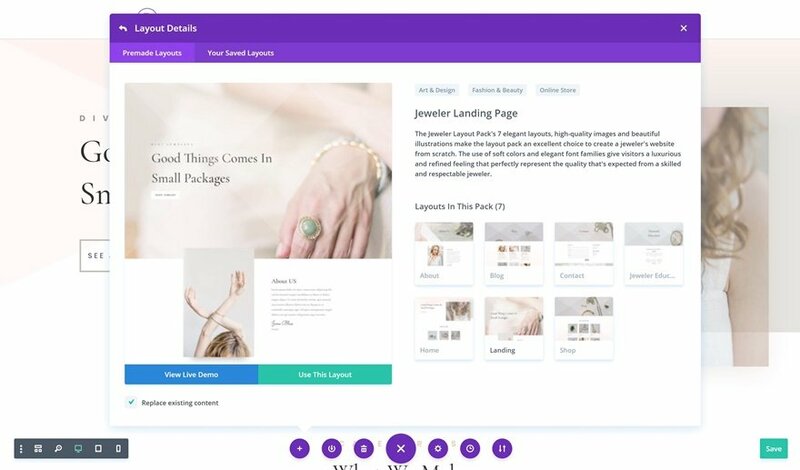 The layouts will always be available inside of the Divi Builder while you are building your website, so there is no need to download them. I do not have any layouts available. 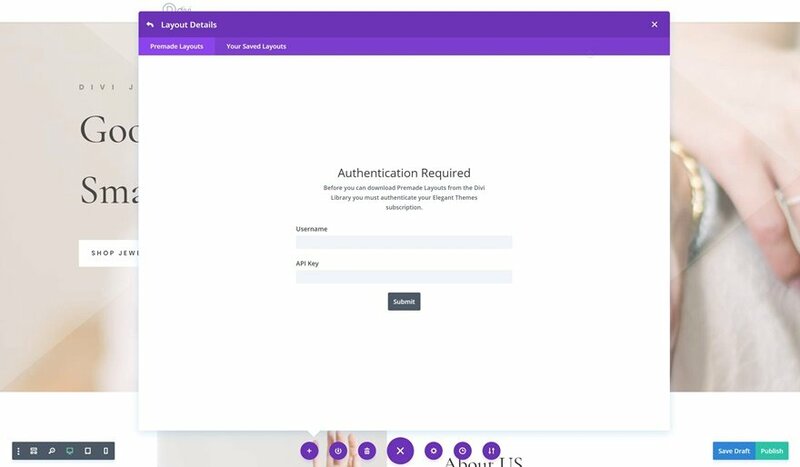 Is there some process you have to do to load them into the divi builder? Another beautiful layout pack! FYI, the high res image download link takes us to a 404 error page. Please let us know when we can download the images. Thanks! Sorry about that. The image download link has been fixed! Divi Space has a non-profit child theme that is detailed, functional, and good looking. I’m actually going to spend money on it because I KNOW I can use it; not as is but easily modify it to get an effective site for a client. Thanks. I’ll keep looking at what you send and use it where/if I can. I agree this is just the kind of layout I was looking for, beautiful, elegant even! So here is my question, can I use the images from another pre-made layout because I don’t have a jewelry shop? Guys, You really need to work on the Menu design, it looks average on every site. Please insert some new design options for Menu bar. You would n’t happen to do a design for a public library anytime in the near future?!? I’m diggin’ this design! Looks simple but has an elegant feel to it. I’m definitely looking to take advantage of this for my next project. Another amazing design ET! Keep the great work! Do you know one of her, do you all know ..
Hi! Very cool design again! Can someone please tell me, where I can edit the default font for these layout pack and it’s modules? H1 is set to “Cormorant Garamond’,Georgia,”Times New Roman”. But i cant find where this is set!!! Hi! 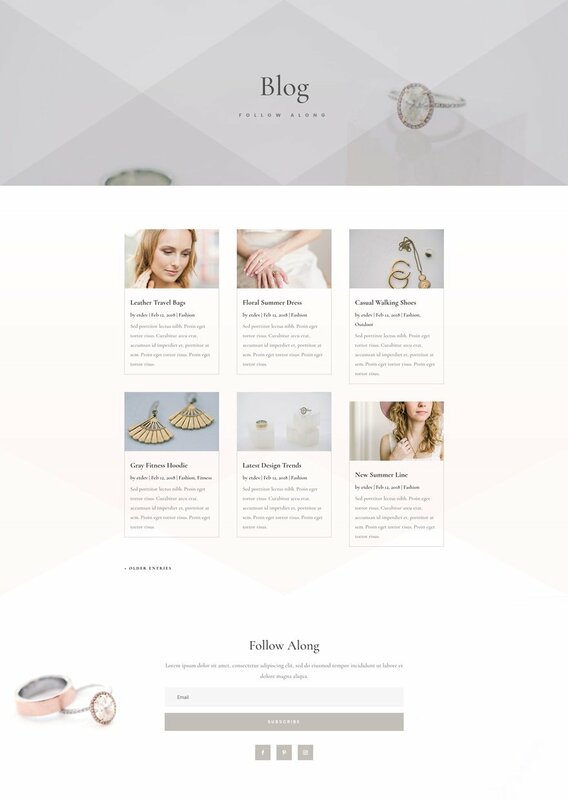 I used this beautiful layout yesterday to redo my site, but after saving and loading the website to view everything, a lot of the images and content don’t appear. This happens no only with the homepage, but also other pages like the “About” and “Contact”. When I go back into Divi Visual Builder, everything is there. It just looks like it isn’t loading when I try to view the actual site. Any suggestions on why this is happening? Thank you!